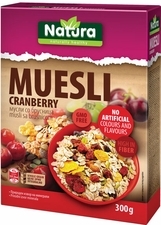 Produced by Natura's original recipe that contains large quantities of dietary fiber, Natura Muesli also presents a natural source of magnesium, iron, zinc, copper, vitamin B1, Vitamin B6, and high amounts of phosphorus and manganese. Due to the natural-mineral composition, this delicious blend of wholegrain cereals, enriched with dried, tropical fruits and a mix of seeds, represents an excellent choice to start the day. It can be prepared with milk, yogurt, juice or tea. May Contain Traces of Soy, Sesame and Nuts products.